Okay – here’s the scoop on how to gather! In the video I show you two ways. The first way is the “old-fashioned” way. In a nutshell, you sew two rows of basting stitches, then draw up the bobbin threads, gathering the fabric as you go. One the plus side – it’s easy to get the gathered fabric exactly the width you want it to be. 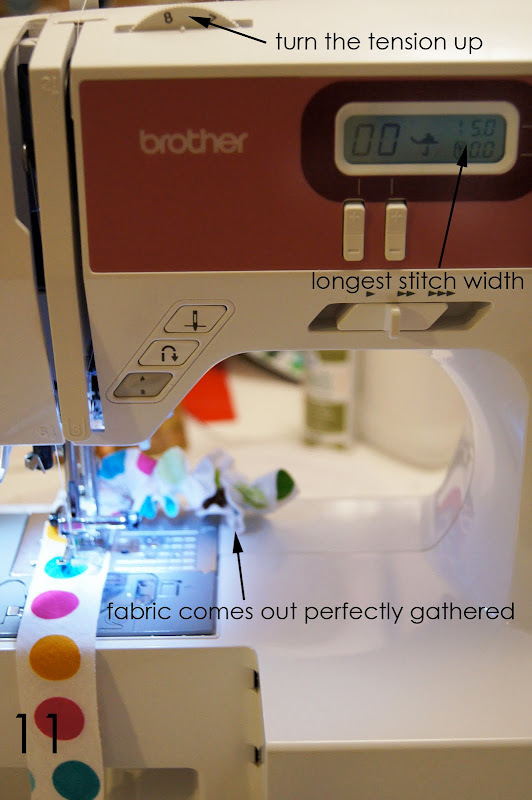 On the minus side – it’s a huge, HUGE pain in the patootie to gather up fabric longer than a couple of feet. Which means that when I made this skirt. . . The other method uses a magical gathering foot that probably doesn’t come with your machine. On the plus side – it’s super easy. On the minus side – you have to pay for the special foot (though it’s not too expensive) and in order to figure out what setting to use to get it gathered the amount you want – you have to do math. When I sewed a 10 inch strip using a stitch length of 6 (the longest setting on my machine) the finished length was 8 inches. 8 divided by 10 is .8, so that means the finished gathered strip was 80% of the starting length. I forgot to show this in the video, but you can also adjust the amount of gathering by adjusting the tension. Less tension = more gathers. So if I need more than 80% gathering, and I can’t make my stitches longer than 6, I start adjusting the tension. With a stitch length of 6, and tension at 2 (I usually sew at 4), then the finished strip is 6.5 inches – or 65% of the starting length. Now here’s where it gets fun. Say I’m making an apron. The width of the skirt panel is 23 inches. I want to fit it into a 15″ section of the waistband. Where the heck do I set my stitch length and tension to gather the top of the skirt? Take your desired (gathered) width and divide it by the current (ungathered) width. That will give you the % change you need. So 15″ divided by 23″ equals .65 or 65%. Hey! That’s exactly what I got when I set my stitch length at 6 and my tension at 2! I tested out lots of strips of regular woven cotton fabric at various length and tension settings and wrote it all down. That’s a fabric I use a lot and it gives me a good starting point whenever I do this – so I don’t have to start from scratch with all of that trial and error. I look up what I did to get the % change I want for whatever project I’m working on. I test it once with the actual fabric I’ll be using, and then I make a small adjustment if I need to. I hardly ever have to make a change if I’m using another woven cotton, but if I’m switching to something a lot heavier or lighter (like a corduroy or a chiffon) I will almost always need to adjust. Does this seem like a lot of work? 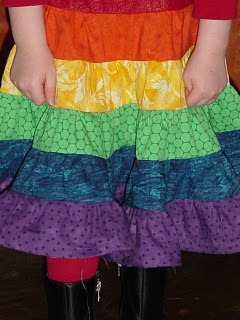 Let’s look back at that rainbow skirt, shall we? Each strip was 1 1/2 times longer than the one above it. If I made it for her today the red strip would be 30″. The orange strip would be 45″. The yellow strip would be 68″. The green strip would be 102″. The blue strip would be 153″. And the purple strip would be 230.” That’s over 19 FEET LONG! Now imagine pulling up those bobbin threads for 19 feet – keeping all your gathers even – and without breaking the thread. The trial and error involved in making that chart doesn’t look too bad now, does it? And think of it this way – make the chart once and use it over and over again for as long as you have your machine. Hi Wendi, my english is not so good but just to let you know that I’ve stitchered your Sly Cat!How much fun I had to do it, thank you a lot! If you want take a look you can find it on my blog! congrats for this great tutorial! althought my english is very poor, I’ll be able to follow all your video. Maybe tomorrow I`ll try to make some gather stuff. thanks for teaching! thank you for the tutorial. explained some concepts very well. there is a picture here ( http://4.bp.blogspot.com/-UbYkQaA7WW8/TadfBidQkCI/AAAAAAAAFkY/-21Uq6fKAjQ/s800/DSC03542.jpg ) that shows how to gather using a regular sewing foot.. it works wonderfully. There’s another method that I didn’t show, involving zigzag stitching over a cord. I HAVE tried that method, but I won’t do it again unless I invest in a couching foot. If you go off course and sew even one stitch into (instead of over) the cord – you have to start all over again. Not fun. Hi Wendi, do you by chance have a video on how to sew a band onto a sleeve? I am just learning to sew clothing and I took on a project, I felt I could do, because I have years of quilting experience. Not the same. Anyway, I am trying to make a jacket and so far have succeeded to making the sleeve, but stuck on sewing the band to the sleeve. The interfacing on this band is on the entire band, not half of it. Thank you. Sorry – I don’t. I’m not really the person you should go to for tutorials on sewing clothing – I’m definitely NOT an expert. It seems like the focus on both Craftsy and Kollabora is very much garment sewing – I’ll bet you can find a good tutorial on one of those sites. Good luck!